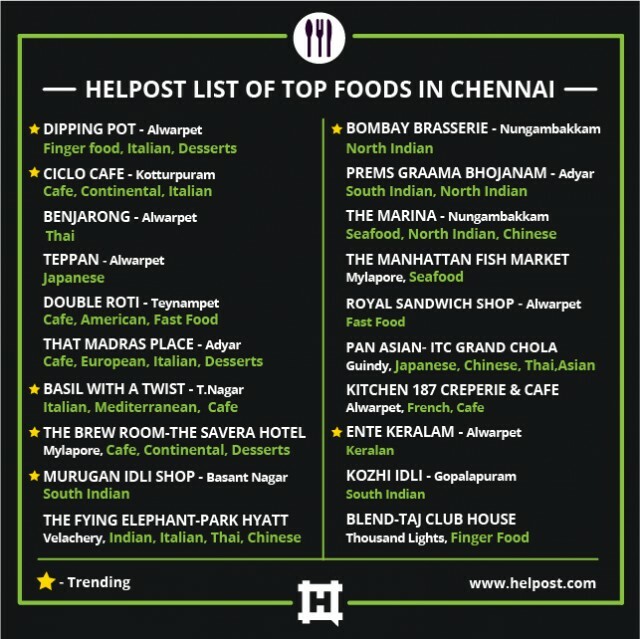 Continuing with our series of top restaurants in various cities, it’s time we explored Chennai. With its upcoming food culture in full swing right now, here are twenty restaurants in the city you must check out in case you’re around. A quaint little place in Alwarpet, Dipping Pot consists of two floors; the ground floor serves dessert and the first floor-authentic Italian cuisine. The staff is courteous and the service is commendable and ofcourse, the signature dish being Fondue, which is a Swiss, Italian, and French dish of melted cheese served in a communal pot over a portable stove and eaten by dipping long-stemmed forks with bread into the cheese. For a calm and quiet afternoon or simply for Fondue, this is the place to visit! Ciclo Cafe is a chic cafe that takes up its bicycle theme quite seriously. The vibrant interiors have a conspicuous use of bicycles and their parts, in the nooks and corners of the cafe. Also, the cafe allows you to hire, ride, and buy bicycles either before or after you eat. A uniquely done up place, the cuisine served is Italian and Continental, which has been played around with, well enough for you to go back for another visit. Japanese food is the best eaten fresh and Teppan makes sure you get yours cooked in front of you, as you sit around the grill making a conversation with fellow diners. Always full on a weekday, the interiors are done up in a comfortable yet minimal way. The food is definitely the forte, which is exactly why you need to make reservations before you walk in for dinner at Teppan. Benjarong is definitely the best place serving Thai cuisine with a top-notch ambience. The menu is quite descriptive with pictures of the food and the staff is extremely friendly and helpful. The place is must try for all the foodies who are up for trying some authentic Thai food. A little heavy on the pocket, but the memorable experience makes it worth the visit. Chennai is all set for a sandwich invasion and Double Roti has been making rounds for the same. The restaurant has quirk served in large dollops. From the rustic wooden furniture, to the dimly lit interiors focusing on the bright and well lit kitchen, or the thought of including maggi on the menu; Double Roti has thought of it all and got it just right. Walking into a house complete with gardens, trees and natural light, you find yourself highly amused when you visit That Madras Place. Little slates with chalk written menus have been put around the place which exudes a beautiful homely vibe. The place serves Italian, Continental and European cuisines satiating you with just the perfect set of desserts. Visit the place for its warm ambience, friendly staff and comfort food. The new place called Basil With A Twist has been making a lot of noise in the city for all the right reasons. You feel like you’ve entered a cafe in Europe, for it’s a massive place with warm woodwork, a well lit kitchen, two European chefs and yellow lights giving it a cosy feeling. You’d want to try everything on the menu, for it is brimming with mouth-watering Mediterranean, Continental and Italian cuisines. It’s a love at first sight and this place is here to stay. The Brew Room is a breakfast all day kind of a place which is not a task that easy. Chef Madhulika does a great job of poaching the egg to perfection, without letting it to get over done, serving it on a toasted muffin base. It’s a place that can be so addictive for you to make more than one visit and it’s just not the coffee; their Continental and Italian cuisine entices you like no other place. Murugan’s Idlis originated in Madurai and all the 12 outlets proudly state the same. Mastering the technique of making idlis, Murugan Idli Shop, serves you the softest and the tastiest idlis accompanied by a variety of chutneys and sambar. The fluffy, soft and delicious idlis can be consumed at any time of the day. But if idlis don’t fascinate you enough, dosas or a full meal is also available which can be enjoyed with a nice aromatic filter coffee. Spread over seven levels, The Flying Elephant has The Living Lounge, The Bar or Den, The Library, The Kitchen, Dining Section, Wood Fire Place and Bedroom: the restaurant’s private dining area. With its dramatic decor, the place has easily become Chennai’s party hub. The cuisine varies from North Indian to Italian to Thai to Chinese or even Continental. It’s a place set to please everyone who visits. India being an outrageously big country, finding food from far-flung regions without compromising on the taste is nearly impossible. Bombay Brasserie – with its authentic North Indian cuisine in literally the opposite end of the county – is certainly out to change that. Its cozy interiors also go a long way in providing you with the perfect experience. If you’re one of those who like their food with no frills attached, PremsGraamaBhojanam is the place for you. With no fancy décor or lighting to distract you from the food, the eclectic mix of South and North Indian food at the restaurant is sure to make you keep coming back to it. Chennai can boast to be the seafood capital of the country, and The Marina is one of the restaurants helping it retain the crown. With cozy and casual interiors and the best of seafood the city has to offer, this one is highly recommended. Probably the most pocket friendly place on the list, Royal Sandwich Shop gets it right when it comes to fast food. To all the sandwich lovers out there – and we know there are a lot of them – don’t miss this one for anything. The first thing you’ll notice entering Pan Asian for the first time is the sheer amount of space they have. With some of the best chefs around, Pan Asian’s menu hosts some of the best Oriental dishes in the city. Kitchen 187 Creperie&Café is a tiny but well laid out café in the heart of the city. One of the few places in the city to serve authentic French food, definitely check this one out for the experience. Another treasure trove of good seafood in the city, the recently launched The Manhattan Fish Market has certainly lived up to the hype. The interiors have a casual, diner vibe to it, and isassuredly high on our list of places to try out when in the city. Serving the best of cuisine from the neighboring state, EnteKeralam is the Keralan restaurant in the city you have to try out. From its Biryani to its curries, everything on the menu is a must-try as far as we’re concerned. Another place on the list that more than makes up for its lack of fancy interiors with its food, KozhiIdli is one place you’d want to keep coming back to. The cuisine is a mix of food from all over South India, and combiing that with the hospitable service makes it one of the best places for authentic food in the city. Being one of the best fine-dining restaurants in the city, we’d definitely recommend checking this one out for its exquisite interiors. And with its elaborate Finger Food menu, Blend at the Taj Club House is perfect for a night of eating-out. Spice Up Your Life! And Make It Fresh!